Hello (Sawadee) and welcome to Thailand, the “Land of Smiles”. A country of rich cultural heritage, mouth-watering cuisine and world famous attractions awaits you. To indulge in Thailand’s raw beauty, one should visit Bangkok, its capital city. walking distance from the main Sukhumvit road and BTS Phloen Chit or Nana Skytrain stations. We offer large contemporary studio, one-bedroom, two-bedroom and three-bedroom suites equipped with a kitchen, washer & dryer and free wifi. Ideal for short or long stay, guests can enjoy recreational facilities including a roof-top swimming pool, fitness center, sauna and a wide selection of pillows to ensure a good night sleep. with shopping centers (Central World, Siam Paragon, MBK center), Skytrain (BTS), MRT and Expressway nearby. We are also less than 1.1 kilometers away from Bumrungrad International Hospital, one of the largest private hospitals in South East Asia. 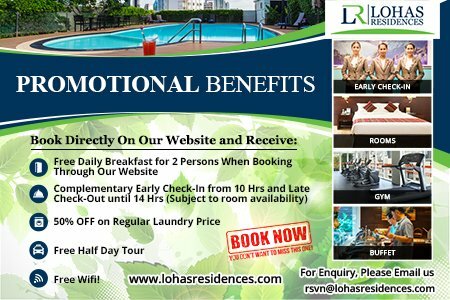 We, at Lohas Residences, aspire to become your home away from home where you can experience exemplary standards of service and hospitality while you plunge in Bangkok’s splendor. Bangkok is the hub for leisure and business. The city is home to several shopping centers as well as tourist attractions such as temples (Grand Palace & Wat Prakaew), floating markets and Koh Rattanakosin, which preserves old-styled architecture uncommon today. Bangkok’s infamous nightlife is well documented on television with an array of restaurant, bars and nightclubs. Whether you’re here with family, friends or on business, this charming city will leave you wanting more.